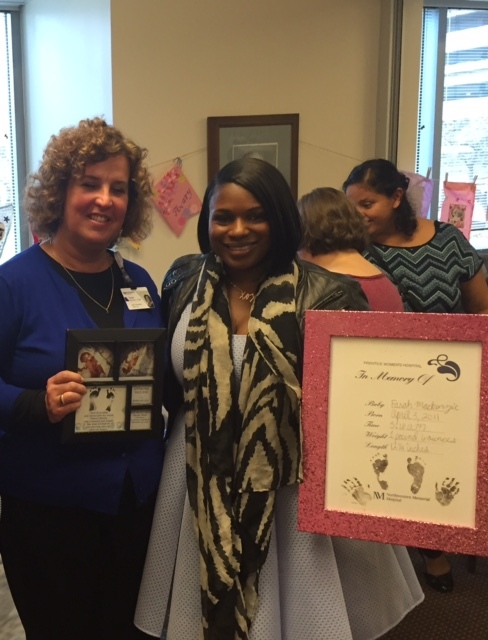 Today, on World Prematurity Day, I wanted to share some pictures from a recent event I attended. I love attending events where I can honor my angel, Farah MacKenzie Desilva, born on April 3, 2011. I am sharing these pictures because I want all of my Angel Mommies out there to know how healthy it is to do things to remember your child. It's important to find you a support system and honestly that support may change over the years but know you will always need support in this area. Just like it takes a village to raise a child, it takes a village to remember a child. Your angel baby is important, their memories are important, and your thoughts about your child are just as important. Keep smiling Angel Mommies, you are stronger than you realize. To learn more about my angel baby Farah, you can click here where I share her story. I love going places where I can make something for Farah. It really means the world to me. All of the parents here made small flags to hang around the room to honor their children. Here I am, holding a portrait of Farah's hand prints and footprints from the day she was born. This lady here, Susan Rizzato was sent by God in 2011. When I had Farah, I did not know where to turn for comfort, other than God I felt so alone, like nobody could really understand. I had a folder from the hospital where I had her and I saw that there was a support group held every month for parents who experienced the loss of a baby. This support group helped me so much and Susan has been running the group for years. Here, she holds up a picture of her son Anthony who passed away years ago. For so long, I did not even know that Susan was an Angel Mommy; no wonder she could be so compassionate and kind to us Angel Mommies. I am forever grateful to have connected with Susan. I love this picture. It's me holding what I have left of my daughter. I cherish her prints, I really do. This annual memorial service is always so beautiful. I get to cry, laugh, and just enjoy time with people like me. Some people experienced loss 10 years ago, but set this time aside to honor their babies. It's such a beautiful thing to share the love.